Heeft u zich al opgegeven voor onze informatiemiddag op 8 november 2014? : Kracht en Macht door Kennis. Een voorlichtingsmiddag over de nieuwste ontwikkelingen in de oncologie, geplaatst in het perspectief van een kankerpatiënt. Het vaccin GP2 toegevoegd aan herceptin - trastuzumab en GM-CSF geeft een betere ziektevrije overall overleving dan alleen herceptin + GM-CSF. De kans op een recidief verminderde met 57% bij vrouwen met borstkanker met Her2 positieve expressie. 94% versus 85%. De studie had totaal 190 deelnemers, die allemaal verschillende vormen van borstkanker hadden met verschillende gradaties van Her2 positieve expressie. De studiegroep (N=89) kreeg naast herceptin - trastuzumab en GM-GSF een vaccin onder de codenaam GP2. de controlegroep (N=91) kreeg alleen herceptin - trastuzumab + GM-GSF. Uiteindelijk kregen uit de studiegroep gedurende een follow-up tijd van ruim drie jaar 88% van de deelnemende patiënten geen recidief versus 81% uit de controlegroep. Uiteindelijk bleek dat 8 patiënten niet de volledige vaccinatie kuur hebben afgemaakt. Wanneer deze werden gecorrigeerd voor analyse werd het verschil nog groter en bleek in de studiegroep de ziektevrije overleving, dus zonder recidief, maar liefst 94% te zijn versus 85% in de controlegroep. een verschil van omgerekend 57%. Een meer dan uitstekend resultaat dus. HOUSTON– A new breast cancer vaccine candidate, (GP2), provides further evidence of the potential of immunotherapy in preventing disease recurrence. This is especially the case for high-risk patients when it is combined with a powerful immunotherapy drug. These findings are being presented by The University of Texas MD Anderson Cancer Center at the 2014 American Society of Clinical Oncology’s Breast Cancer Symposium in San Francisco. One of only a few vaccines of its kind in development, GP2 has been shown to be safe and effective for breast cancer patients, reducing recurrence rates by 57%. Further, women with the highest overexpression of HER2 (known as HER2 +3) had no cancer recurrences when they were administered the vaccine after completing trastuzumab (Herceptin), a type of immunotherapy drug known as a monoclonal antibody. 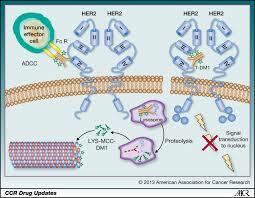 HER2 is an oncoprotein that promotes tumor growth and is expressed to some extent in 75-80% of breast cancers. The findings are the result of a phase II randomized trial that paired the GP2 vaccine, designed to stimulate the CD8+ cells, commonly known as “killer” or “toxic” T cells, with an immune stimulant known as granulocyte/macrophage colony stimulating factor (GM-CSF). The trial included 190 patients with varying levels of HER2; 89 women received the GP2 vaccine with a GM-CSF adjuvant and a control group of 91 patients received GM-CSF alone. Eight patients experienced early recurrence or developed a second malignancy and did not complete the vaccine trial. The vaccine is injected subcutaneously and the initial series consisted of monthly inoculations for six months, followed by four cycles of booster shots administered every six months thereafter. The patients were monitored for nearly three years. For all 190 patients, including those who did not complete the trial, the disease-free survival (DFS) rate was 88% among those who received the vaccine and 81% in the control group – representing a 37% reduction in recurrence. Excluding the patients who did not complete the vaccine series, the results are higher – 94% DFS rate versus 85% who did not get GP2 – a 57% risk reduction. Women with HER2 +3 who were administered trastuzumab as part of the standard of care prior to receiving the vaccine experienced no cases of cancer recurrence. According to Mittendorf, trastuzumab may act like a primer for the vaccine. Trastuzumab stimulates CD4+ T cells to release substances that fight cancer cells and initiates an antibody response. Thus, it may prepare the immune system, making the vaccine even more effective. MD Anderson is now testing this combination of immunotherapies in other clinical trials. The GP2 study supports previous MD Anderson research on similar breast cancer vaccines, such as AE37, which showed a significant immune response and improved recurrence rates in triple-negative breast cancer patients. Another candidate, E75, known as NeuVax or nelipepimut-S, showed a 50% recurrence decrease in high-risk patients. Currently, NeuVax is being tested internationally in a phase III clinical trial. Reageer op "Vaccin GP2 naast herceptin geeft significant betere resultaten na 3 jaar dan alleen herceptin bij Her2 positieve borstkanker copy 1"